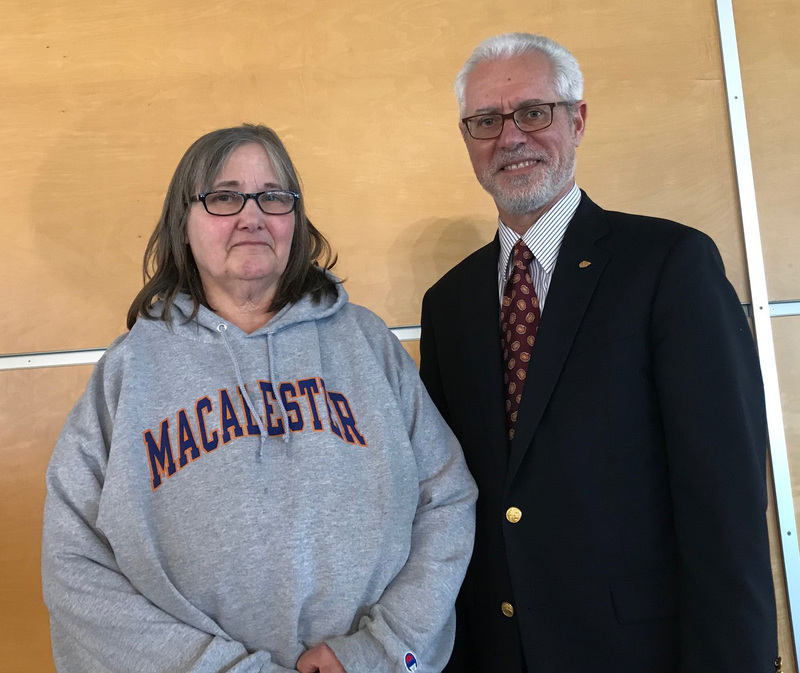 St. Paul, Minn. – Barb Olson, Facilities Services, has been awarded the 2019 Staff Outstanding Service Award. 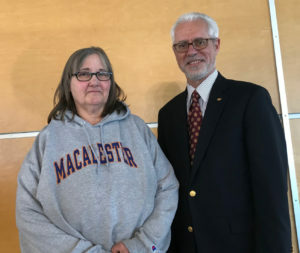 In celebration of the ways in which your work has made this campus safe and pleasant for students, faculty, staff, and visitors, we are proud to recognize you with the 2019 Staff Outstanding Service Award. You are fond of saying it’s the small details that matter. For 35 years, you have been doing hard work that often goes unnoticed because it is done so very well. As part of the custodial team, one of things you do is to provide pre-event, post-event, and sometimes even mid-event support at gatherings and ceremonies across our campus. Because of your great attention to detail and the pride you take in your work, event spaces small and large are thoughtfully, accurately, and consistently prepared. Everything looks right. Events have appropriate chairs for guests and speakers, the most attractive podium, the proper tartan. These details make all the difference at Macalester. Perhaps even more important, you do your work with positivity, kindness, and humor. One of your 12 nominators wrote, “Barb is a complete delight to work with.” Another mentions your big heart. Your work ethic and calm demeanor consistently elevate the situations you are in, and countless new employees have benefited from your example as well as from the training and mentoring you have provided to them. Proactive is the word used most to describe you. “Barb is proactive in her work, often identifying issues or problems and taking action to resolve them on her own,” wrote a colleague. Others note the way you are always thinking about how to do things better. Your colleagues are grateful for the keen advice you provide regarding floor plans and event set-ups, and how you go beyond the job requirements of just setting up a space. You always consider your work’s deeper impact—how students, colleagues, and guests will experience Macalester. Your supervisor notes that you are always the first to respond to any radio or emergency calls. In fact, it has become a department competition to see if anyone can get to something before you do. This quality, coupled with the vast institutional knowledge you have gained over your years of service, has made you virtually irreplaceable. “We here in custodial would be lost without her,” wrote a colleague. Thank you, Barb, and congratulations on this award. We are truly grateful for your outstanding service.